In 1997, Linn Maxwell Keller, a mezzo-soprano who had sung at top Bach Festivals throughout the United States, launched the Grand Rapids Bach Festival as a three-day, community wide celebration of music. Karl Hochreither, director of the Bach Choir of Berlin, served as music director for several of the early festivals. In 2013, the Grand Rapids Bach Festival became an official affiliate organization of the Grand Rapids Symphony. Past guest artists at the Grand Rapids Bach Festival have included pianist Angela Hewitt and the Bach Collegium Japan led by Masaaki Suzuki. Linn Maxwell Keller founded the Grand Rapids Bach Festival to give her community the entertainment and enlightenment of experiencing music by the greatest composer in the history of Western Classical Music. Before her death in 2016, the mezzo soprano had graced the stages of top Bach Festivals throughout the United States. Her presence still was felt at the 12th biennial festival, which ended last week. The eight-day Grand Rapids Bach Festival, which opened March 17, ended with a grand and glorious finale with Bach’s Magnificat in D Major under the masterful leadership of its new Artistic Director Julian Wachner on Saturday, March 23. In his first season at the help of the festival founded 22 years ago, Wachner led soloists, the Grand Rapids Symphony and Grand Rapids Symphony Chorus in a sold-out performance in the Basilica of St. Adalbert. It was the climax to a big week of inspired events including the inaugural Linn Maxwell Keller Distinguished Bach Musician Award and its $10,000 prize awarded to soprano Nola Richardson, who sang the soprano aria from the Mass in A Major among her three competition selections. Less than three hours later, the singer from New York City sang the same aria, only this time with The Choir of Trinity Church Wall Street and the Grand Rapids Symphony, as a last-minute replacement on Thursday, March 21, in St. Mark’s Episcopal Church. Earlier in the week, Wachner himself opened the 2019 Grand Rapids Bach Festival with a brilliant solo organ recital on Monday, March 18. Some 450 people filled the Basilica of St. Adalbert for an amazing evening of music by Bach plus virtuoso organ works by Maurice Duruflé and Charles-Marie Widor. 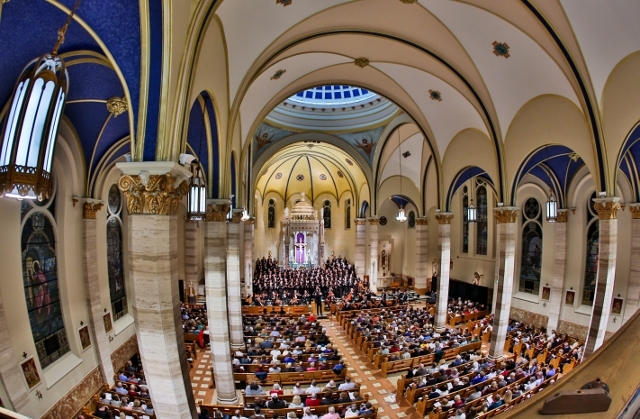 For the Grand Rapids Bach Festival’s final concert in the Basilica of St. Adalbert on March 23, Wachner led a program including Bach’s Cantata No. 110, “Unser Mund sei voll Lachens” and Igor Stravinsky’s Variations on Bach’s “Vom Himmel Hoch.” But the climax was the Magnificat in D Major, the first important liturgical work by Bach using a Latin text. It’s also a wonderful piece of music, which Wachner conducted with passion and precision in equal measure. With no fewer than 125 singers in the Grand Rapids Symphony Chorus, the performance was certain to be big and bold. And with a fireball for an Artistic Director who’s a bundle of energy even at rest, it was destined to be even a little over-the-top. The Grand Rapids Symphony Chorus sang bright buoyancy, sending waves of sound crashing through the sanctuary in the program featuring soprano Molly Quinn, a satisfying, last-minute substitute for Molly Netter, who had to withdraw from the performance; and the robust voice of bass-baritone Dashon Burton, who performed with the Grand Rapids Symphony. 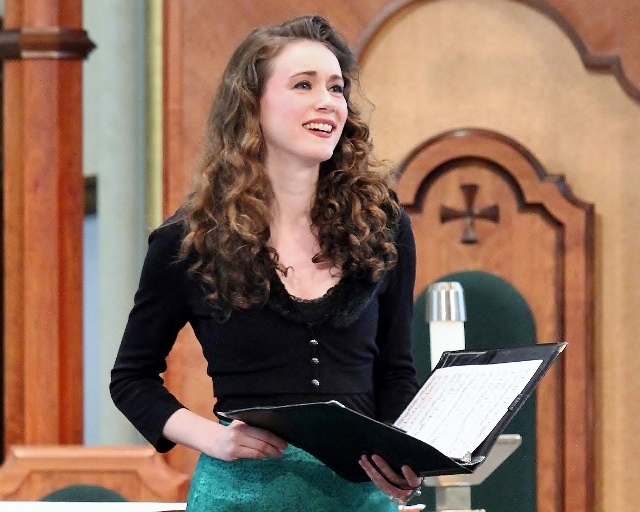 The performance also featured mezzo soprano Melissa Attebury, countertenor Daniel Taylor, and tenor Brian Giebler, all making impressive debuts with the Grand Rapids Bach Festival and Grand Rapids Symphony. 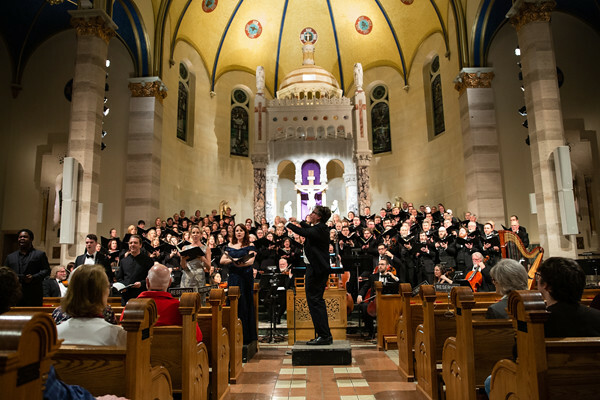 On Thursday, March 21 for the Mass Reimaginings concert, Wachner led an evening of sublime music by Bach plus sensational music of his own, expertly performed by the Grand Rapids Symphony and The Choir of Trinity Wall Street from the famous New York City church in lower Manhattan. Its 28 professional singers sounded like twice as many. Richardson, the newly-minted Keller Award winner, stepped in as a last-minute substitute, joining Taylor, Giebler and Burton for a lovely performance. The Choir of Trinity Wall Street was a joy to listen to. The ensemble from the famous church in lower Manhattan was well-rehearsed and well-balanced. Their opening Kyrie was florid and flowing. The Gloria delivered enough sound to raise the roof of the historic Grand Rapids church that opened in 1848. Leonard Bernstein’s “A Mass,” a theatrical piece that’s as much about the drama as it is about the music, was the inspiration for Wachner’s Epistle Mass, which uses the ordinary of the Latin Mass interspersed with a modern text in English by librettist Royce Vavrek, representing a letter composed by the last human being on earth, written for a future alien race to discover. The choral passages are ambitious, full of thick, meaty chords and seemingly random vocal lines all requiring accomplished singers to perform. The Grand Rapids Symphony played superbly on the piece that called for a wide variety of tone colors from strings as well as from a complex battery of percussion. 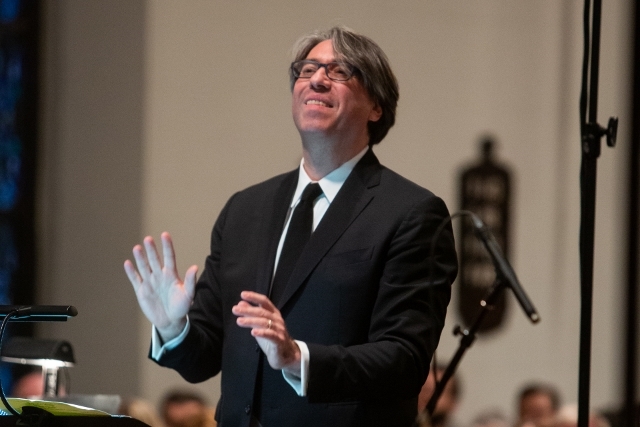 Wachner, who is Director of Music and Arts at Trinity Church Wall Street, led a thrilling performance of the Gloria with rolling waves of sound and vivid gestures. The artistry of the Choir of Trinity Wall Street was breathtaking on the Sanctus. The sweep of the final Agnus Dei with organ added to orchestra and chorus truly was climactic. Mass Reimaginings concluded with a well-deserved standing ovation. On Monday, March 18, Wachner played an exciting solo organ concert with some 450 people in the Basilica of St. Adalbert, watching the performance on closed-circuit TV, giving them a close look at Wachner’s fingers and feet. Like Bach, Wachner is an accomplished virtuoso who performed an elegantly tasteful version of Durufle’s Prelude et Fugue sur le nom d’Alain, and a show stopping performance of Widor’s Toccata from Symphonie No. 5, which made good use of the resources of St. Adalbert’s Wicks pipe organ. No less impressive was his performance of Bach’s Fantasia in G major, Piece d’Orgue, a three-part work, which Wachner said implies three stages of life from childhood to adulthood to old age. The first part was a delightful section for manuals only, suggesting children at play. The dense, polyphonic middle section was evocative of the challenges and complexities of maturity. The finale, growing softer with a slow, descending progression in the pedals, called to mind the quiet of final years and the peaceful conclusion to a long life. Taken together it made for an interesting musical journey led by a master performer. Across a long week of events, Wachner demonstrated he’s not only interested in performing the music of J.S. Bach with integrity, he’s interested in reaching for much more. Disclosure: Jeffrey Kaczmarczyk, Senior Manager of Communications and Media Relations for the Grand Rapids Symphony, formerly was an arts and entertainment writer and classical music critic with The Grand Rapids Press and MLive for 23 years.